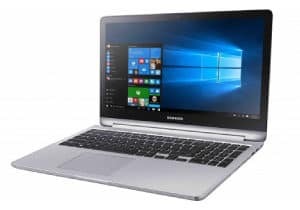 Why Should I Pick A 2-In-1 Over A Normal Laptop? Will I Be Able To Upgrade My 2-In-1 Laptop With More RAM? 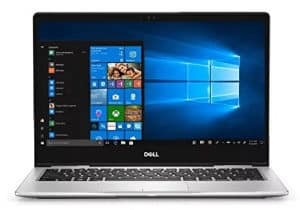 What Are The Best Sizes And Styles For 2-In-1 Laptops? Portable devices featuring touchscreens are undeniably the future of computing, but some users still want a full keyboard as well. Thankfully, you no longer have to choose between a tablet and a laptop! With hybrid machines hitting the market, now you can get the best of both worlds. If you’re just starting to compare and contrast what’s available, we’re here to help with a roundup of the 10 absolute best 2-in-1s in this year! When picking a 2-in-1 machine you want maximum flexibility, and I don’t just mean that it should rotate 360 degrees in any direction. Hybrid computers are significantly more versatile than either a standard clamshell laptop or a touchscreen tablet. Because you will be using the device in a variety of different modes, be sure to take into account what features you aren’t willing to lose. For instance, do you absolutely need an HDMI out port? What about an optical DVD-RW drive or extra USB ports for external peripherals? From there, it’s time to consider what size will work best for your needs. Are you more excited for an extremely portable unit that’s only 10 inches wide, or do you want a desktop replacement at 15 or 17 inches? Unfortunately, Apple hasn’t jumped into the convertible arena yet, so there won’t be any iPad style devices listed below. There’s no shortage of options from other manufacturers however, from Dell to Samsung to Acer and beyond. 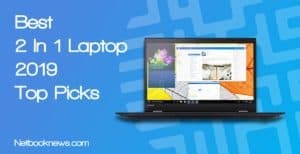 Why should I pick a 2 in 1 over a normal laptop? Will I be able to upgrade my 2 in 1 laptop with more RAM? What are the best sizes and styles for 2 in 1 laptops? Just getting started trying out hybrid 2-in-1s, or looking for a very cheap model to give to the kids? 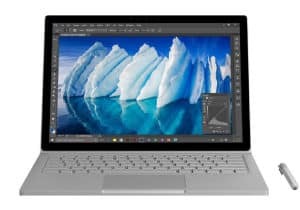 This should be your pick if sticking to a budget is your main concern over any other feature and need the best 2-in-1 under $200. Here’s the thing — you get what you pay for. Convertible laptops with Windows 10 at this price range won’t have nearly the speed or power of a regular laptop. With only 2GB of onboard memory and an integrated graphics card, this isn’t a powerhouse machine by any stretch of the imagination. If you don’t need a high end machine though, this is the perfect low budget option. You simply won’t find a fully functional Windows 10 computer with a touch screen anywhere else at this price. Managing expectations will be key to getting the most out of this Yuntab unit. With these specs, you’ll primarily be web browsing, sending emails, and typing documents. Anything past that will strain the device beyond its capabilities. Keep in mind you will also need to buy a microSD card for extra storage. The standard Windows 10 updates will eat a 32GB storage capacity for breakfast. If you intend to save any documents or images on this laptop, you will absolutely need extra storage space. 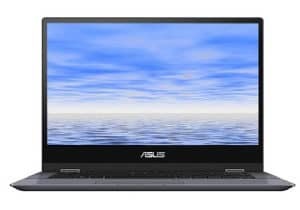 There’s one big advantage to this model over others though — you get a full HD screen with 1920 resolution, which isn’t often found in budget laptops. Keep in mind that there’s an alternative to this unit if you find running Windows 10 with 2GB of RAM is too slow for your needs. If you don’t mind using all Android apps, you should strongly consider a tablet or Chromebook instead if you need to stay under the $200 price range. Looking for a high end 2-in-1 experience with a focus on portability at a low price point? This should easily be your pick if you only have a few hundred to spend and want a lightweight device. 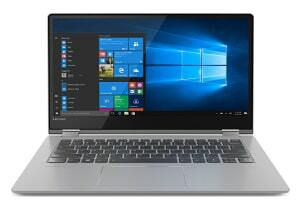 Although it is about the same size as the Yuntab model listed above, you get significantly hardware specs by picking the Asus VivoBook instead. The big selling point here is packing those specs into an incredibly portable 11 inch device. If you’ve found that other hybrid models are too bulky or unwieldy in tablet mode, this is an excellent pick. With double the RAM and storage space, you also get better performance and significantly more room for saving files or installing programs. That being said, 64GB is still pretty small for a Windows 10 machine, so make sure to pick up a USB storage drive or an SD card for extra storage. Note that his version of Windows starts in S Mode, which only lets you download certified apps from the Microsoft app store. If you prefer the full Windows 10 experience, it’s simple (and free) to upgrade from S to Home. To get these specs at this price in a 2-in-1 model you’ve got to go refurbished, which means the device has been previously used but repaired and restored to factory settings. Not interested in a refurbished laptop? If you’re willing to bump up slightly above $300, note that there are several brand new 2-in-1 VivoBook options readily available at Amazon. Willing to ditch Windows 10 and go with the more secure Chrome OS instead? This should easily be your pick for a killer 2-in-1 touch laptop! Most of the 2-in-1 devices in our list of contenders will feature the full Windows 10 operating system. 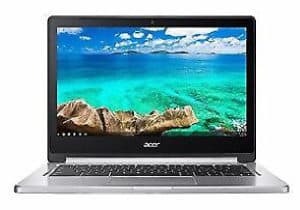 That’s not the case with this Acer model, which utilizes the Chrome OS. There are both pros and cons to this approach. Most notably, it means you can’t install Windows programs and have to use apps instead. There’s a major silver lining there, however. The Chrome OS has significantly enhanced security over the many vulnerabilities in the Windows platform. Unlike many standard Chromebooks, you also get an ARM processor with the Acer R 13 convertible. Why does that matter? ARM processor work better with Android programs, which means you get far better functionality from Google Play apps than with similar machines. For users who bought this model, the main selling points are the extremely high battery life, fast boot time, and excellent screen. There are several design issues frequently criticized by buyers who write reviews after using the device for a few months. They all deal with the way Acer chose to deal with the issues inherent to a laptop that can spin around 360 degrees. First up, the power button is an awkward position that makes it easy to accidentally press down. Whether picking it up or placing it in your backpack, you can expect to turn it on and off while getting used to the design. That same issue is brought up with the SD card slot. An inserted SD card pops out fairly easily as well, so be careful where you hold the R 13 in tablet mode for the first few days. Finally, the stock power cable is a little wiggly and can fall out easily when moving the device. If you leave your tablet on your lap when charging, it may be worth investing in an aftermarket charger. Want the same level of specs you’d expect from a full business laptop but in a budget form with a 2-in-1 design. Lenovo’s ThinkPad Yoga has you covered as our top pick for the best 2-in-1 under $500 on the market right now. Laptop aficionados will endlessly debate the perfect size for a hybrid machine. Your personal preference may vary, with some users preferring the tiny 10 inch and others needing the 13 – 14 inch designs. Smack dab in the middle is where you’ll find this Lenovo unit, and that’s one of its main selling points. 11 ½ inches isn’t so large that its awkward to hold, but not so small that the keyboard becomes cramped and useless. At this price range, you can finally get out of the lower end and find some machines that will offer fast performance no matter what kind of programs you use. 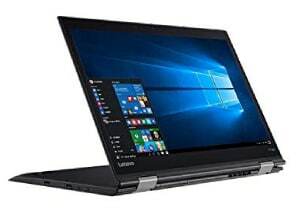 With the 8GB RAM and solid state drive combo, Lenovo’s Thinkpad Yoga can easily serve as your main work, home, or school machine. You also get Windows 10 Pro here, which is a rarity at this low a price. If you use advanced networking features for office purposes, that’s a big plus. When your done with work and need to switch to tablet mode, it’s easy to flip the device around with the 2-in-1 hinge. Oddly this particular Lenovo model doesn’t include a stylus, but it does have a stylus holding slot at the bottom built into the case if you decide to buy one later. Want an absolutely killer hybrid laptop that’s extremely lightweight but doesn’t have a huge price tag? This should be your pick for the best detachable laptop! You may need to read that weight column a few more times to let it sink in. Yes, this laptop weighs 1.15 pounds. You’ve probably bought heavier produce at the supermarket! Microsoft manages that weight by using a detachable keyboard instead of the 360 degree rotating hinge of the other contenders. That’s both a pro and a con, because you have to buy the keyboard separately. Even with that added cost you can stay at just under $600, however. The Surface Go is easily one of the sleekest and most well designed 2-in-1 devices while still maintaining the specs you want from a laptop. Two potential issues should be considered before picking the Surface Go that are regularly cited by reviewers. 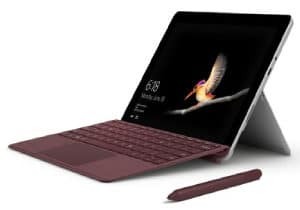 Due to its size and tablet nature, the Surface Go is clearly meant to be used with a pen, but strangely it doesn’t include one out of the box. If you want to use a stylus for Microsoft Ink, you’ll have to buy that peripheral separately. This model also ships with Windows 10 S, which is the stripped down version of Windows that can only install apps. That’s significantly more secure than full Windows, but reduces your options considerably. You aren’t stuck with the S version permanently, however. Its completely free to upgrade to Windows 10 Home — it just means you add a good deal of time to the initial setup process. Willing to spend a bit more to get a truly high end hybrid experience? This should be your pick for the best 2-in-1 laptop! Here is where we officially start to get into the truly high end machines with the Lenovo Flex 6. While offering 360 degree rotation and a touchscreen, this unit outclasses many standard laptops in terms of specs. You don’t lose out on any extra features, either. A fingerprint scanner is included, and the Flex uses a backlit keyboard for typing in low light conditions. For this price range, getting an 8th gen processor and a 256GB SSD in a hybrid machine is a steal. Lenovo even decided to throw a dedicated graphics card on this machine, so you can use it for gaming or video editing as well. Although still smaller than a full laptop, the Flex 6 is significantly heavier than our other contenders. In this case heavier is a relative term, however, as three-and-a-half pound isn’t going to break your back by any means. The Lenovo Flex remains quite thin despite that added weight at slightly over half an inch thick. For a 14 inch screen, that’s quite the feat of engineering. One particular issue with this model is consistently mentioned by buyers. For some reason, the bottom edge of the screen bezel is oddly large — nearly an inch thick! That can be helpful so you don’t accidentally click something, but some users have noted the large bezel is distracting. Like with the Surface Go, the pen is a major factor in getting full use of the device, but it isn’t included and must be bought separately. Those two issues aside, this is a fabulous hybrid machine for the price point. Looking for the absolute best convertible laptop with a huge screen for streaming videos and high specs? This should be your pick! I bet you didn’t expect to see a computer with a 17 inch display in a list of hybrid 2-in-1s! Yes, even convertible notebooks can be found with big screens for better viewing. Obviously the bigger screen means a heavier overall computer. While this is nearly double the weight of most other contenders on our list, it remains under an inch thick for portability. It’s not just the size that’s big either, as the specs on this Dell inspiron are quite monstrous as well. 16GB of RAM and an 8th gen processor mean you’ll have a screaming fast experience with any kind of usage. There’s also a dedicated graphics card, so if you like some gaming on the side that option is available. Dell made an interesting trade off on the storage capacity front, which could be a positive or negative depending on your needs. This model has an absolutely massive storage capacity with a full 2TB hard drive. Going that route means slower boot speeds than with an SSD, but much more space for saving files. For reviewers, there are two potential problems to consider with this model. First off, if you were expecting to get an optical drive along with the bigger size, you’ll be disappointed. The larger viewing area also makes this model less useful in some configurations. While it’s easy to prop up into entertainment viewing mode, you probably won’t use it as a tablet due to the size and weight. Finally, watch out for the power button, which is located low on the right side. If you have the Inspiron tented up into viewing mode, it is very easy to accidentally turn off the screen. 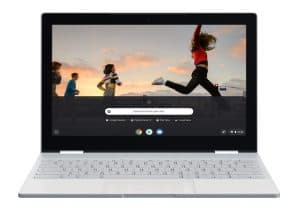 Want the highest end Chromebook money can possibly buy? This should be your pick for the best 2-in-1 laptop! There’s no doubt about it, the Google Pixel is the current reigning champ of the Chromebooks. It’s not a cheap unit — not by a longshot — but it is worth the price. Tiny storage space is a constant problem with Chromebooks, but that’s not even remotely a concern with this device. You get 512GB right out of the box before using any external storage drives or online storage solutions. If you’re concerned about losing functionality with the Chrome OS, you shouldn’t be. The Google Pixel now supports Linux apps in addition to Android apps, so you have a full suite of software to utilize. The Pixel features a large amount of RAM, but this isn’t particularly a gaming device and there’s no dedicated graphics card. For that feature, check out the Lenovo Flex 6 or Dell Inspiron 7000 contenders above. On the positive side, buyers constantly reference the laptop’s fast speed and excellent build quality. A potential negative to consider is that the Pixel Book only features two USB ports. That means if you are charging the device and have any connected peripherals, you are officially out of ports. For power users who attach external monitors, keyboards, mice, storage, etc. you will need to get a USB hub. Need great specs and a long lasting device for several years of schooling? This should be your pick for the best hybrid laptop! Any laptop is going to feature pros and cons for just students. Do you want more memory to avoid lag while keeping multiple tabs open, or do you want lighter weight for carrying between classes? The Samsung Spin is an excellent middle-of-the-road option for students that has a little bit of everything. While still rotating 360 degrees, you get the standard 15 inch screen size that will be more familiar to students. College students who bought this model often reference the well designed keyboard for typing lecture notes, emailing your professors, an so on. The backlighting is also a plus for working late at night without turning on the lights and waking up your roommate. Unlike many other hybrids, this Samsung model has a dedicated graphics card. That’s a plus for college kids looking to unwind on the weekends with a couple of rounds of Fortnite or Call Of Duty. At five pounds, this is a bit heavier than the usual three pound hybrid device. If that’s going to be a problem carrying around in your backpack, you may want to consider one of the other contenders instead. Finally, you should consider the longevity of this Samsung model above cheaper options that usually die after two to three years of usage. Yes, you pay a much higher starting price here, but it will easily last an entire four year college course and beyond. 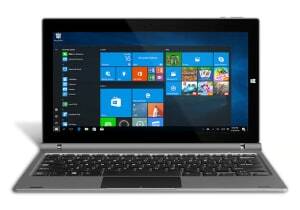 Need the absolute best quality 2-in-1 laptop possible for a long term business applications? As long as you don’t need an HDMI port, this should be your pick. 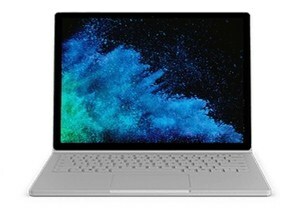 For our best business pick, we’re going to go with the cadillac of 2-in-1 — the revamped Surface Book 2. Just by browsing through the specs alone, you can tell this is a machine that will get any job done. Whether you are handling the books or making new ad mockups, the Surface Book has you covered. Between the 16GB of RAM and dedicated graphics card, you can use pretty much any program out there without any lag. This is particularly helpful if you need to use high end video editing tools or frequently mark up documents with a pen. One of the biggest draws for business applications is that the battery will last for a full work day and beyond. In other words, no one ever has to stop their work project to plug into an outlet. Buyers also frequently mention the high end screen doesn’t seem to collect fingerprints like many other touch devices. There is one glaring downside that could cause problems in a workplace setting. This particular model doesn’t have an HDMI out port. That means you’ll need to use USB devices instead (or buy an adapter) when connecting to an external monitor for work presentations. This entire answer can be summed up in one word: versatility. Nothing else comes close to the wide range of features and options you get with a hybrid notebook computer. Want to be in tablet mode for reading an ebook or browsing social media? No problem. Need to sit your device up like a tent for streaming videos? Done and done. When it’s time for some serious typing or you want to use the touchpad for gaming, just flip the machine back over into standard laptop configuration. Except for at the very lowest price points, hybrid machines typically have great overall specs and high battery life. That means you don’t lose out on anything you’d get with a standard laptop. If you frequently use a stylus or pen for drawing designs or marking up documents, a 2-in-1 should be your starting pick. For users who don’t ever utilize the touchscreen features, then going with a standard clamshell laptop would be a better idea, however. This is on the one and only area where 2-in-1 hybrid laptops are currently outclassed by their standard counterparts. There are a few exceptions here and there, but for the most part 2-in-1 devices aren’t currently designed with upgrading in mind. That may change in the future as they become more prevalent, however. Comparing all your options before making a final purchase decision is critical with a hybrid machine. The specs you get out of the box are the same specs you’ll have for the life of the unit. In general, the only upgrade possibility will exist by connecting an external USB hard drive or using an SD card for additional storage space. For now, a standard laptop is the way you want to go if you intend to upgrade the RAM or want to install a second SSD. Now that hybrid devices are penetrating the market and dominating in sales, we’re seeing an explosion in the number of options available. Your first decision should be whether to go with a detachable keyboard model or a unit with a 360 degree rotating hinge. If you want the lightest laptop possible and only use the keyboard sparingly, a detachable unit is the way to go. For users who frequently switch back and forth between tablet mode and laptop mode, make absolutely certain you get the 360 degree flip version. The best overall size for a hybrid device is a much more subjective choice, and you don’t have any lack of options. From 10 – 17 inches, convertible laptops are available in a huge range of sizes. For most users, sticking somewhere in the middle will be the best way to try out a hybrid notebook. 10 inch models frequently have overly small keyboard designs, while 15 to 17 inch screens may be too big to use the device effectively in tablet mode. Because of their slim designs and smaller screen sizes, there will be a lot of overlap between 2-in-1 devices and ultrabooks. You may want to take a look at what lightweight laptops are up for grabs as well. Finally, don’t forget you can often choose between Windows 10 or the Chrome OS with hybrid machines. While you may be more familiar with Windows as an operating system, Chrome is worth checking out if you use web-based applications more than executable files. What did you think of our picks, and are you planning on buying any of these models soon? 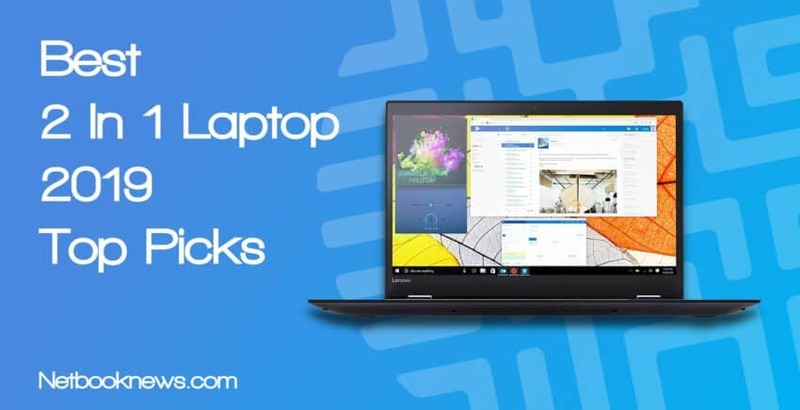 Let us know when you find your perfect hybrid laptop in the comments below!